Joining the Minecraft gaming scene is artificial intelligence- well, kind of. As part of an experimental version of the game developed by Microsoft, the new platform, called Project Malmo, was designed to train and stimulate an AI to carry out various tasks like crossing bridges and building elaborate objects. The Project Malmo platform allows a learning algorithm to control a Minecraft character normally operated by a person. Another cool aspect? The platform allows and encourages human-AI interaction and collaboration: human players and AI can work together, with even a chat window for the person to talk with an AI. The platform trains an AI by providing tasks and rewards, with a human player coaching instructions that the AI would recognize over time. 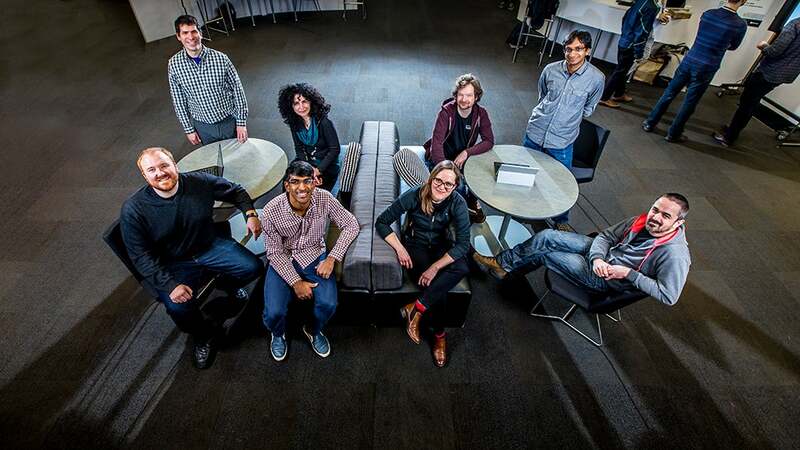 Microsoft researchers working on Project Malmo include, from top left, Fernando Diaz, Evelyne Viegas, David Bignell, Alekh Agarwal, Matthew Johnson, Akshay Krishnamurthy, Katja Hofmann and Tim Hutton. Image credit: Scott Eklund/Red Box Pictures. Lead researcher Katja Hofmann states that by giving an environment for AI to learn to complete a task with room for trial and error, while being rewarded for right choices, it would develop approaches to reinforcement learning. According to Microsoft’s blog on the project, the ability for AI to comprehend people similarly to how we understand each other is one of the core aims for the research. Minecraft, which started as an indie game and acquired by Microsoft in 2014, gained popularity from letting its users build complex structures and objects, and with Project Malmo, AI are even taught to craft using tools and resources for building a table or sword, as well as navigating, and mimicking other tasks. Microsoft AI researchers who have tinkered with it can see how others compare to the same environment, based on different theories and variants. It has since launched the open-source experiment for the public, so if you’re tech-savvy and into AI, machine learning and robotics, now’s your chance to play around with them all.